Around 25 months, Camden was crazy about puzzles. He was in an interesting place where he was easily completing 4 piece jigsaw puzzles, but 12 pieces were still too frustrating for him. I wanted to give him a new challenge and also introduce a new component to the puzzles, without overwhelming him with too many pieces. I started looking around and found some wonderful three dimensional puzzles that gave him a whole new challenge, while still meeting his need for fitting pieces together. These 3D puzzles help develop fine motor control and spatial reasoning. The 3D puzzles have by far been the most used work on his shelves for the past few months. One of my favorite things about these puzzles is that the pieces within each set are interchangeable, which has allowed him to creatively put them together. When we first got the Lilabo set from Ikea, Camden's strong sense of order would not tolerate the puzzles being put together in anyway other than how they were packaged. It has been fascinating to watch his creativity grow and see how the puts them together now to make his own unique designs. We have the three different sets of 3D puzzles listed below. These are the first set that we got for Camden to try and are the simplest of the 3D puzzles in this post. The pieces fit together with holes and pegs. 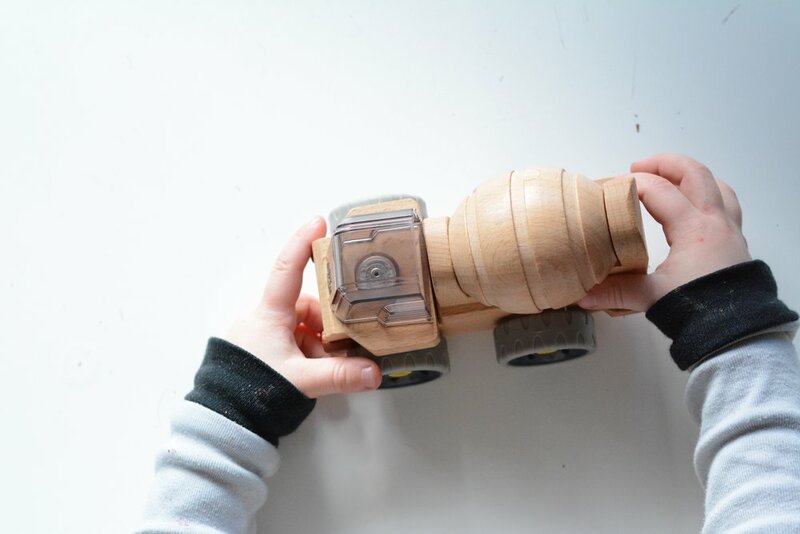 The pieces were a little tough to take in and out at first, but we found that they loosened up enough for Camden to use independently quickly. These are inexpensive (especially at an Ikea store). The only downside is that after three months of heavy use the parts do not stay together as tightly as I would hope, but for how much they have been used they are awesome! You can find the single car and the vehicle set (with the police car, regular car and loader) by following the links. After seeing how much Camden loved the Lilabo cars, I was on a quest to find other 3D puzzles and found this lovely truck at a local toy store. I can not say enough good things about them. These puzzles have a few more pieces than the Lilabo set- even the wheels come off! The pieces stay tightly together, even after months of heavy use. We have the truck (pictured) and also the emergency vehicle set. I happened to find one other set of 3D puzzles after reading one of my favorite Montessori blogs https://nduoma.com. These are lovely 9-piece wooden pieces held together by magnets. I love that the drum on the concrete mixer and the rotor blades on the helicopter really rotate. These are truly lovely, but unfortunately they are no longer in production. We found our helicopter on Amazon and the concrete mixer on eBay. Here are some other links you can try to hunt one down: firetruck, pickup truck, helicopter. 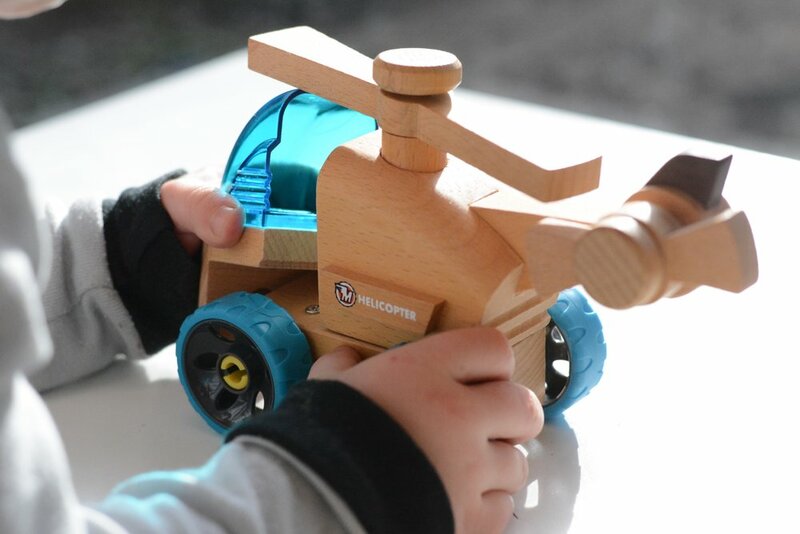 Manhattan toys also makes a new line called Motorworks that is similar to the Automoblox, but we have not tried them. What types of puzzles do your toddlers enjoy using?